Last night, I was sitting up thinking about how I wanted to tell the story of Kirill becoming our son. I just have so many things to tell you guys about the MIRACLE that has taken place over the last week. It's hard to believe that just one week ago, we were on a plane, heading to Moscow, with NO IDEA that we would be bringing Kirill home. I didn't post this on the blog, but the best hope we were given was that the Supreme Court would cancel the judge's original ruling and grant us another hearing in our region. This was our understanding of the court system here in Russia, as well as our agency's understanding after talking with our lawyer in Moscow. We were told that this trip was strictly for the supreme court hearing, that we would come back to the U.S. as soon as it was over and IF we were granted a new hearing in K's region by the supreme court, we would have to wait for anywhere from 1-3 months OR MORE for a new hearing in the region. But there wasn't an official timeline so even that time estimate was uncertain; we were told it could be longer or it could be shorter. BUT GOD HAD A DIFFERENT PLAN. I WANT TO SHARE THE STORY OF HOW KIRILL'S MIRACLE HAPPENED. But as I was thinking about where to begin, I kept thinking about my friend Karrie Cannell, who is in the process of adopting two brothers from Eastern Europe. Their story kept interrupting my thoughts and made me pray hard for them. Karrie and her husband Donnie originally committed to one of the boys, Carson, and started the process to adopt him. Well, as the process moved forward, they found out Carson had a biological brother in another orphanage! So what did they do? They committed to adopt BOTH BOYS. 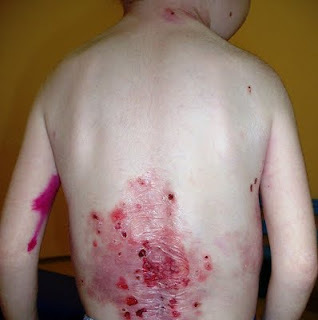 Carson and John have EB, or Epidermolysis Bullosa. EB is a genetic skin condition that causes painful blisters to form anywhere the skin is exposed to friction. The skin is so fragile that even the slightest touch can cause painful blisters that are prone to infection. Many children do not live for very long with this condition because of the high risk of infection. There are many precautions that have to be taken to care for the sores and prevent new blisters from forming. It is painful to see the photos of these boys because I know what orphanage conditions are like and I know that these boys do not get good care for such a fragile condition. Honestly, I'm surprised they are still alive because orphanages are not the cleanest places and they certainly aren't the most medically attentive places. THEY NEED TO COME HOME SOON. These boys are in different orphanages in different regions because John is older and had already been transferred to an older children's orphanage. This means Donnie and Karrie have to come up with about twice as much money to adopt the two boys because they have to do it separately, and they have to have the money before they can travel to pick up their sons. They are submitted and just waiting on "the call" to go get their sons. How much do they need? Right now, about $20,000...which may sound like a lot, but really it's NOT. God can do that in no time at all! Remember the 7-Day Blitz for Kirill? $13,415 is what we have on Reeces Rainbow. $1,000 deposit,~ if you will~ that we get back from RR. $1,052 is what we have in Paypal. I'm going to tell Kirill's miracle story, but not until the Cannell's are fully funded. As I was trying to type up K's miracle story last night, I just couldn't get Carson and John off my mind. I cannot imagine how this family must feel facing such expenses, BUT MONEY AIN'T NO THANG TO GOD! I have received almost 5,000 hits daily on this blog for a while. If each one of those people who visit donates $4, we could raise this amount in NO TIME AT ALL. If you think it's not your responsibility to help, then stop reading this blog. Because God COMMANDS us to care for orphans. That's not a "calling" that's a command...there's a BIG, HUGE DIFFERENCE. So, I'm asking all of Kirill's army to please give a little or a lot, however God leads you to give. Pray first, then ask God to tell you what he wants you to give. Don't dismiss this post and say, "I'll do it later." Go to the chip-in NOW and donate. 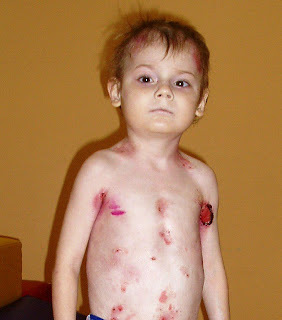 As soon as they're fully funded, I'm going to share the miracle of Kirill's story. But until then, I just can't do it because I keep trying and I can't get the Cannell boys out of my mind when I try to write. I know it's God telling me to advocate for them. So what are you waiting for??? Click on the Chip In below and DONATE. Let's get these boys HOME! donated. you are an awesome lady! wow, so excited for you all. poor little guys their fragile skin looks so painful praying for full funding to quickly get them home. are their regions easier to adopt from than K's? It's done. Still so amazed by the miracle that happened through Kirill. Praying for another miracle for this family. These pictures are just heartbreaking. Just donated....so glad you shared this story :) More of God's children need to be in loving families! Done :) looking forward to God moving in mighty ways for this family. Donated $5 because I can't afford more but hope it helps!! Congratulations on getting your son! I have prayed every single night for him (and you all) and am so happy to see that he is with people who love him now! Done! Praying you have safe travels back home. Praying for them. Donated also- hope that fund fills quickly!! Those boys need to be home, and I am so anxious to read Kirill's amazing story! Donated! Wish it could have been for the full amount. AWESOME! Let's get these boys home! Gave what I could--it's not much, but it's something and if we ALL give a little, it will add up to ALOT!!! Gave a little and prays everyone else does too because it can add up fast. Saving all we can to bring home our baby girl. I gave a little but wish I could give all. Tesney, I Adore you. I simply adore you. I just read this post with GREAT joy. and though you know I am broke myself with my current adoption and bding in Siberia right now (lol)....but God told me to send $20 immediately, and you know I'm obedient!!! GOd bless you and God bless these boys and their parents-to-be. I challnge eVERYONE to send $20, so they can reach their goal even faster! If I can do it, ANYONE can! Praying for these sweet brothers & this family! Shared this on facebook. Can't wait to see how God moves!! Great idea - I've been wondering where God sought for me to tithe my most recent part-time job's paycheck, and today that was perfectly clear!! Done! Glad to help John and Carson, and looking forward to hearing about Kirill's miracles! God bless. I could only donate 4.00 but I did donate! Good luck with your adventures and I hope all the kids make it home o.k. May God abundantly bless your efforts and this precious family! Done! You're an amazing woman.. We will have these babies home in no time! Done. Thanks so much for supporting this family! Donation sent, our family knows how desperate you can feel trying to raise so much money at once, especially when you do it twice. Donated a few minutes ago and posted on my FB page as well as my husband's. Can't wait to hear Kirill's story! So In love watching Gods hands at work! Done and sharing on facebook! Donated!! Thanks for inviting us to be a part of this miracle to bring home John and Carson. Hope we don't have to wait long to hear Kirill's miracle story!! Done. God speed these little ones home! Done. Wish our donation could have a few more zeros at the end, but I know that every bit counts. I am excited to hear about these boys coming home!! Just donated... I love how you are using that whisper from God to do something so powerful for another family. 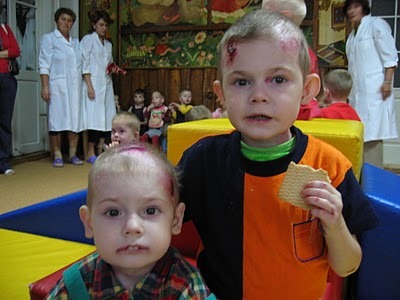 Praying for these boys and praising God for Kirill's miracle (and I can't wait to hear that story)!! Done. Wishing John and Carson a speedy, safe homecoming. Done! If getting these boys home is what we need to do to hear your miracle story, it is WELL WORTH IT! Donated! Much love as you bring your boys home. Donated. Praying for these boys to be reunited and on their way to their loving family. Donated $12.00...it's not much, and I wish it could be more. Donated again.did so at Patrices' blog the other day but I just can't get these kids off my mind. Praying and wish I could do more but on a pension so just can't. Good form Tesney. We love us some Carson and Paul. LOVE LOVE LOVE. Done! I hope these little guys get home fast. Donated! Grateful for your sensitivity to the Spirit. Can't wait to hear your story... and thus theirs! we dont have a lot but how could we not donate. 4 for my hubby, 4 for me and 4 for Violet. I hope that is three steps closer to getting those boys home! I was in tears this morning, trembling with the certainty of the truth in your words. Finally got to my computer tonight to chip-in and be a part of this, too. Praying for those precious boys. Blessings to you, mama. Big blessings. If everyone donated $4.... I wish I could donate for 400 people, but I could only donate a few x me. I couldn't not share something though. Those boys need a home. We can do these easily! I love being in the miracle making business. Thank you for helping Krill and the 2 boys in Eastern Europe. We adopted from Siberia and it was over $45,000 so i know the pain! Donated! God Speed Cannell Family, hope you are together soon. It's a pleasure to donate to get these boys home...and boy do I want to hear a Kirill story!!!! I'm so excited to see God working to bring these lovely boys home to their family. He is SO good! Happy to give to this wonderful family!! I donated. Thanks for letting have this opportunity to share. Donated! Can't wait to read about their homecoming. And Kirill's also. So exciting! Mommy. Wife. Noonday Ambassador. Social Worker. Blogger. Advocate for Diabetes, Down Syndrome, and Adoption. I love to laugh until tears run down my cheeks. I have been known to exaggerate for effect.